The Elara, a Hilton Grand Vacations Club, 80 East Harmon Avenue, is one of Vegas’ most impressive hotels. 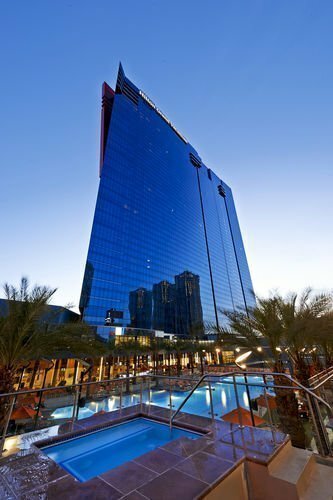 The Elara, a Hilton Grand Vacations Club, is a massive 52-story Vegas hotel, which sits at the very heart of Sin City neighboring the Planet Hollywood Resort & Casino complex. It boasts an impressive number of magnificent suites (1,201), whose floor to ceiling glass windows provide spectacular vistas of the majestic city below. 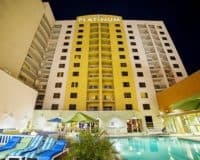 The location also provides easy access to the Strip and Fremont Street Experience, making it ideal whether your visit is for business or pleasure. The hotel provides a remarkable array of amenities, including a refreshing pool, open all year round, a coffee shop, so you can start your day the right way and a seasonal poolside bar, where you can buy thirst quenching drinks during the hot summer months. The hotel also features business facilities and a well-stocked gym, along with all the usual things such as free parking and easily accessible WIFI. The rooms are truly spectacular, offering majestic panoramas of the bright lights of Vegas, along with a host of other great features. These include luxurious beds to sleep on, fully-stocked kitchens and leather-clad lounge areas, which are ideal to entertain clients or friends while enjoying the amazing view. The rooms are also very modern, featuring plenty of technological devices, such as HD televisions and air conditioning. This means that your room is a great space to work and relax in, making the hotel perfect for anyone visiting Vegas. The Elara, a Hilton Grand Vacations Club, is one of Vegas’ most impressive hotels: with an amazing location and awe-inspiring views of the bright lights of the city. People visiting the city for either business or pleasure will find a stunning range of amenities, which will meet their every need. Location: Situated in the centre of The Strip, the Elara Hilton towers over the nearby establishments to give their guests a magnificent view of Vegas at all times. For those who want to experience the Vega extravaganza in its entirety, the hotel overlooks The Cosmopolitan Resort and the Vegas City Center. The entire package, in a nutshell is designed to guarantee unadulterated fun. Outdoor Features: One of the biggest selling points when it comes to resorts is a well equipped outdoor environment. In a place like Vegas that sees the sweltering desert heat, having a place to cool off is a major priority. In keeping with the demands of the visitors, the hotel has a pool with whirlpools, a cabana and a pool bar. Daybeds dot the poolside and the service as regards food and beverages is stellar. The Rooms: Spacious, luxurious and comfortable, the Grand Vacation suites are one of the most enviable aspects of the resort. 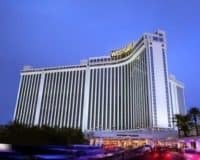 A king sized bed, complemented by a cable package on the TV, free hotel Wi-Fi, room service and a well stocked mini bar- all of this makes the Las Vegas Hilton Luxury Hotel a must see and visit on everyones bucket list. Spa Treatments: The Eforea Spa has six treatment rooms that cater to a wide range of preferences. Deep tissue massages and intensive aroma therapy are just a few of the specialised treatments that Eforea offers. From using soothing salts to herbs and different kinds of flowers, the spa treatments here are a worthwhile investment and much needed to get away from the noise and hustle of Vegas. Family Time: While many equate Vegas with parties, casinos and other adrenaline fuelled activities, there is a side to Vegas that many overlook. Spending some quality me time or time with your beloved and family is a great idea while living at The Hilton. In fact, this is one of the biggest reasons thousands of people flock to Elara every year. The entire atmosphere of the place is inclined towards allowing one to rest, reset their clock and rejuvenate themselves. From young to old, the hotel’s luxury experience is one that cuts across age boundaries in terms of its appeal. Since relaxation in luxurious opulence is the key principle of the establishment, it captures the perfect essence of a Vegas vacation.